Elbrus is the highest mountain in Europe. Located in the western Caucasus. Elbrus like Kilimanjaro is one of the "Seven Summits" which consists of the highest mountain in each continent. Day 1 - Arrive in Min.Vody. We'll take the ski lifts up Elbrus and then take a short aclimatisation walk. Return down to our hotel. We will walk from the base to the barrel huts on Elbrus. Rest day. Might look at some winter skills. Day 7 - Summit day Mt Elbrus(5642m). Day 8- Summit day Mt Elbrus(5642m). We can run any date on demand for groups of 4 or more. If you want we can advertise an open expedition date to help you find the numbers you need. If you have any questions about climbing Elbrus then get in touch. 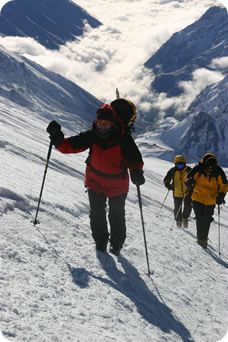 Leadership: Elbrus expeditions are run by experienced UK expedition leaders who have prior experience on the mountain. They generally will have experience on peaks over 8,000m and have advanced mountain medical knowledge and training. Information on your individual leader is available before departure. Groups of just 4 people may be led by one of our experienced local guides.